For a few months, I’ve been wanting to create posters exploring self care and communities of care. While I haven’t started the self care poster series (yet! 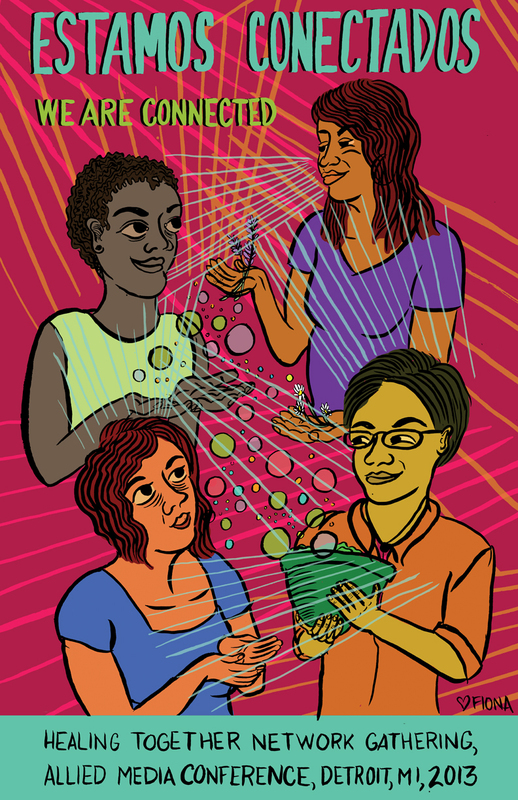 ), I recently finished the below poster, Estamos Conectados/We Are Connected, to raise funds for the Allied Media Conference‘s Healing Together Network Gathering. -the character in the top right is a herbalist (hence the lavender and chamomile in each hand). -the character on the bottom right is a food maker/healer through food. -the character on the bottom left is a singer/poet/healer with words. -and the character on the top left corner is a listener, an advice giver, and also a healer with words. The light blue lines show the connection and support for each other through their healing practices while also taking care of themselves. For those interested in the Allied Media Conference, it takes place every year in Detroit, MI. This year it runs June 20-23rd. I went a couple of years ago and met some really great folks working on wonderful, innovative projects towards media justice and radical social change. I recommend going if you can! As soon as these posters are for sale, I will post details so you can support a wonderful group of people doing amazing work!